REX-POL Sp. z o.o. produces fully automated, energy-saving and environment-friendly smokehouses. 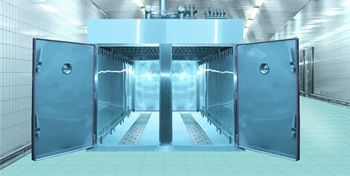 Because of the large variety of manufacturing technology in food industry we produce smokehouses in two variants of airflow inside a device: vertical and horizontal circulation. A smokehouse allows for thermal processing of meat, cured meat products, fish, poultry and cheese. It allows for performing the following technological processes: preheat, drying, cold and hot smoking, smoking with steaming, baking and cooling. Smokehouses, because of their modular structure, are made in single, double or multi-trolley versions depending on the client’s needs. Available heat sources: electric energy, technological steam, gas or oil. 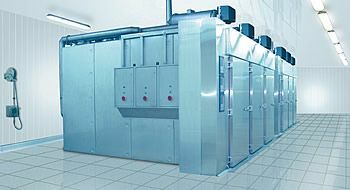 Standard version of the smokehouse is equipped with following subsystems: high-class microprocessor controller ensuring automated regulation of parameters of every process inside the chamber, two-stage air circulation system inside the chamber, automated smokehouse cleaning system and high-performance chip incandescent smoke generator. Additionally, smokehouses are optionally equipped with smoke cooling system and thermal afterburner. Smokehouses manufactured by REX-POL are characterized by long life and many years of high performance because of the best materials and reliable technical solutions.